Welcome and thank you for choosing to study at CUCC! Every year, the International Relations Office (IRO) welcomes both Spanish and international students through different mobility programmes. SPAIN: Programa SICUE (Exchange Programme between Spanish Universities) endorsed by the Conference of Rectors of Spanish Universities (CRUE) to promote the mobility of undergraduate students between Spanish universities. Students can carry out part of their studies in a different university with guaranteed academic recognition and adaptation to their educational profile. The IRO offers 67 term and annual stays in 18 universities located in 7 Spanish autonomous communities (Andalusia, Asturias, Canary Islands, Catalonia, Valencian Community, Galicia, and Murcia). EUROPE: Erasmus+ Programme. A European Union programme that promotes International Mobility in Education, Training, Youth and Sport. It is most well-known for promoting learning for students, teachers, and administrative staff through international mobility. GLOBAL MOBILITY: The IRO manages several Global Mobility Programmes in the rest of the world, under the authority if the University of Alcalá. BILATERAL AGREEMENTS: CUCC holds bilateral agreements with 10 universities located in Brazil, South Korea, Japan, Kazakhstan, Mexico, and Russia. INTERNATIONAL MARIST NETWORK OF HIGHER EDUCATION INSTITUTIONS. The Marist Brothers religious congregation is the promoting entity of Centro Universitario Cardenal Cisneros. CUCC also forms part of the International Marist Network of Higher Education Institutions, an organisation comprising over thirty universities located throughout the world, which share the same educational mission and principles of identity, belonging, equality, and participation, and which promote the mobility of students in Marist centres. A programme aimed at students from universities that do not hold agreements with the University of Alcalá or CUCC. The IRO is in Office 16, located on the ground floor of the Academic Building, next to entrance door 5. Most likely, the IRO at your university will have already informed you that you should go to the IRO at CUCC when you arrive in Alcalá de Henares before the start of the term to obtain your arrival certificate. In addition to the information needed to start the course (timetables, campus map indicating classrooms and professors’ offices, TUI university smart card, CUCC smart card, etc. ), at the IRO, you can request the help of a student volunteer from our Buddy Programme, who will be your local guide and help you to integrate into academic life as quickly as possible. Your buddy can help you with administrative tasks and show you how to use the Virtual Campus and library. 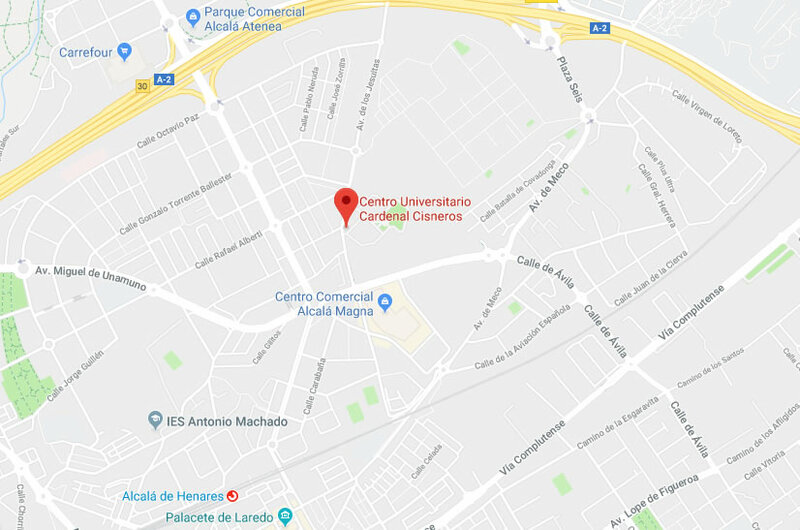 Also, you can ask your buddy about the best way to get to the campus or about cultural and leisure activities both at CUCC and in Alcalá and the surrounding area (Madrid, Segovia, Toledo, etc.). These are official degrees of the University of Alcalá (UAH). All degree courses are taught in Spanish. Therefore, you must be able to demonstrate that you have at least a B2 level of Spanish according to the Common European Framework of Reference for Languages (CEFR) to study on one of our programmes. If you have not yet reached this level and wish to improve your Spanish, the University of Alcalá has a language centre called Alcalingua which offers official Spanish as a Foreign Language courses (www.alcalingua.com). The Bilingual Project (Spanish/English) at CUCC offers a wide range of subjects taught in English as part of the Infant Education and Primary Education degree courses. Almost 50% of the course credits are taught in English by professors who are specialists in their subjects and teaching in English through the CLIL approach. During classes, the professors are also supported by native English-speaking language assistants. To study on the Bilingual Infant Education and Bilingual Primary Education degree courses, you must demonstrate that you have at least a B1 level of English according to the Common European Framework of Reference for Languages (CEFR). To take an elective subject from the Specialisation in English Programme (Mención de inglés), you must have a B2 level of English. Please note that being accepted to CUCC does not guarantee that you will be able to take all the subjects requested in your Learning Agreement. This is because certain subjects have a limited number of places and sometimes the timetables of different subjects overlap. However, at the IRO, we will help you to find a solution. All postgraduate courses are taught in Spanish. You must demonstrate at least a B2.2 level of Spanish to take a postgraduate course. Master’s students from other universities wishing to take subjects of an equivalent Master’s programme at UAH or CUCC may only do so if both universities have a dual degree agreement for the specific Master’s programme. In exceptional cases, in the absence of a dual degree agreement, a student may be accepted to a Master’s provided that they have obtained a letter of acceptance from the Director of the Master’s Programme at UAH or CUCC. In such cases, the student may take a maximum of 24 ECTS credits of the Master’s programme. Undergraduate students interested in taking subjects of Master’s programmes at UAH or CUCC can request a maximum of 24 ECTS credits per academic year. These credits can be distributed over different Master’s subjects without the need for a dual degree agreement with their home university. In any case, the Directors of the Master’s Programmes must issue a favourable report or letter of acceptance indicating that the student has been approved for specific subjects. This report must be issued before 30 June for year-long or first-term subjects, and before 15 November for second-term subjects. As stated in the UAH Admission and Enrolment Guide, after starting classes, visiting students will receive a payment form in order to pay the enrolment fee into the indicated bank account before the established deadline. CUCC is a private centre administratively linked to the University of Alcalá. This means that students must pay public fees to the UAH and private fees to CUCC. The public fees for official degree programmes are set by a decree issued by the Community of Madrid, within the limits established by the Board of Universities. These fees break down into a payment for academic services and a further payment for administrative and student insurance. To calculate the total amount to be paid, take the total number of credits to be studied and multiply it by the amount set for the specific credit in accordance with the decree. The private fees for Undergraduate and Postgraduate Degrees vary according to the number of credits taken by the visiting student. Fees are paid in instalments by direct debit. The payment details will be provided by the Student Secretary Office. To calculate the total amount to be paid, take the total number of credits to be studied and multiply it by the amount set for the specific credit in accordance with the decree. In line with our Marist identity, visiting students from other universities or higher education centres from the International Marist Network of Higher Education Institutions will benefit from a 20% discount on the total amount. For more information, please see the UAH Admission and Enrolment Guide for Exchange Students for your specific mobility programme.